Experience the art of tasting with some of the most sought-after varietals and others that are hard to find by the glass. 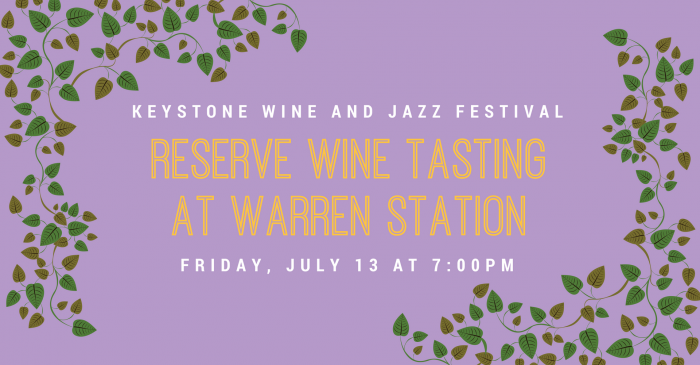 Warren Station brings the wine country to the mountainside as rich reds and sparkling whites intertwine with the summer palette of Keystone Mountain. Wine specialists educate and entice tasters with samples of bursting flavors and luscious bouquets while gourmet appetizers from Gilchrist Catering and live music compliment an elegant evening to prelude the Wine and Jazz Festival. Enjoy the delicious cuisine and sip a variety of wines while listening to music from Groove Machine featuring Sheryl Renee, a high energy dance band that will be sure to keep the party going all evening. New this year, raffle items will be given away every 30 minutes. Prizes will include various event tickets as well as 1.5L bottles of wine. All ticket purchases will include a raffle ticket. Entry includes unlimited samplings while supplies lasts. All advance reservations can be made at www.warrenstation.com or www.keystonefestivals.com. Limited Seating Available – This Wine Tasting is a social affair!